Myungjin (MJ) Kim blends the real and surreal in her drawings and paintings on porcelain forms. She creates narratives that run parallel to and address the complexity of the human experience. Working instinctively and drawing inspiration from European still-life paintings, she frequently uses human and animal figures as well as the birdcage, bird nest, terrarium and perfume jar in her forms and imagery. The narratives she builds come from ideas between the real and imaginary worlds which are purposefully intertwined. Returning to the Bray after a summer residency in 2011, MJ is hoping to grow and to better understand her artistic impulses while at the Bray. Myungjin was born in South Korea. She received her MFA in ceramic art at Seoul National University in 2002 after which she moved to the United States. 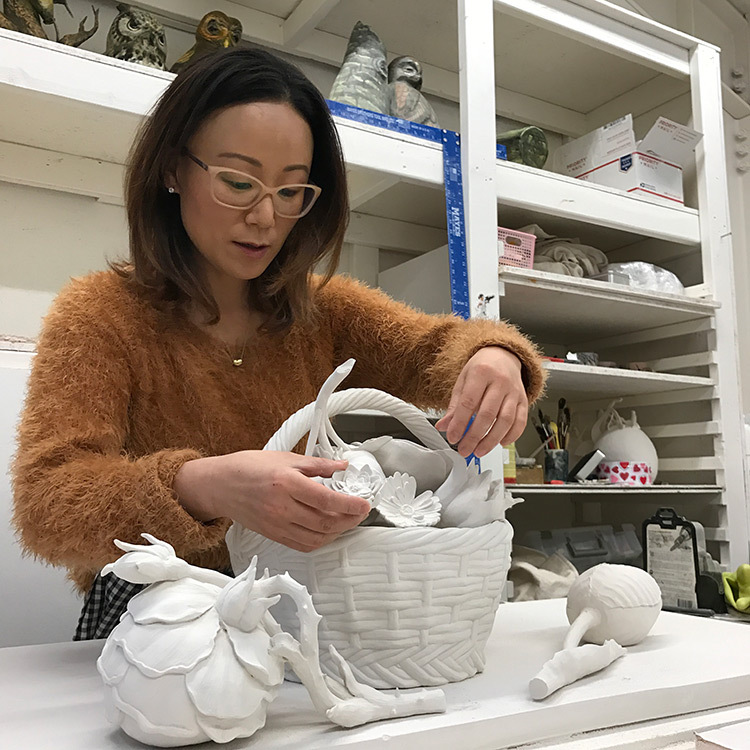 MJ has taught ceramics at Santa Ana College, University of Georgia and at California State University, Long Beach. Her work is featured in private and public collections in the United States and Asia. Myungjin Kim was a summer resident at the Archie Bray Foundation in 2011 and is currently the 2016–2017 Taunt Fellow. To view more work by Myungjin visit her website at www.mjkimstudio.com.